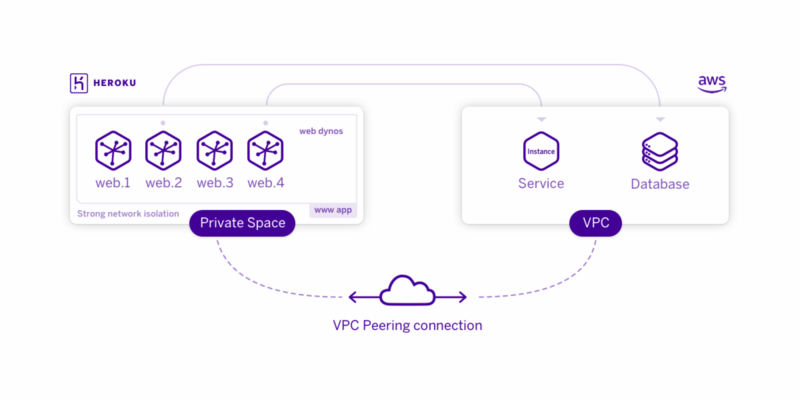 Private Space Peering enables you to establish a private network connection between dynos running in a Heroku Private Space and an AWS VPC you control. This connection does not traverse the public Internet. The VPC must use a compatible IPv4 CIDR Block in its network configuration. The VPC must use an RFC1918 CIDR block (10.0.0.0/8, 172.16.0.0/12, or 192.168.0.0/16). The VPC’s CIDR block must not overlap with the Private Space CIDR ranges. The default ranges are 10.0.0.0/16, 10.1.0.0/16, and 172.17.0.0/16. Private Space CIDR range can be specified when creating a new space. Your AWS account must have permission to make a VPC peering connection request. Inter-region peering has some limitations. See AWS VPC Peering documentation for details. To configure peering, you submit a peering request from your AWS VPC and then confirm it via the Heroku dashboard or CLI. The AWS Account ID and AWS VPC ID fields contain the information you’ll need when making the peering request via AWS. The AWS VPC CIDR field contains the CIDR block in use by the Private Space VPC you’ll peer with. The Dyno CIDRs are the CIDR blocks from which your dyno and ELB addresses are assigned. You can use this information to route CIDR blocks (rather than the AWS VPC CIDR, which is a /16 block) inside your VPC. Before you initiate a peering connection, ensure that your VPC does not overlap with the values of either AWS VPC CIDR or Unavailable CIDRs. Heroku manages other peering connections in the Private Space to allow private networking to certain add-on partners. These connections have the type heroku-managed, and they cannot be modified. After you establish a peering connection, you must update the route table in your VPC so packets can be routed between the Private Space and the VPC. Look for the route table with the same VPC ID as your VPC and obtain its route table ID. At this point, you can choose to either add a single route for the entire Private Space CIDR (recommended) or add specific routes for the subnets that contain resources that components in your VPC will be interacting with. The destination-cidr-block argument must match one of the dyno CIDRs indicated by the heroku spaces:peering:info command. You must run the create-route command for each of the dyno CIDRs. You must ensure that the security group assigned to resources in your VPC allows traffic from your Private Space. By default a VPC is set up with a network ACL that allows all inbound and outbound traffic and most customers restrict traffic at the resource level, via security groups. If your organization is restricting traffic to the subnet via a network ACL, you’ll have to create a traffic rule to allow inbound traffic from your Private Space. Connections to web processes in a Private Space on appname.herokuapp.com or a custom domain name are made over the public Internet, not the peering connection. You can only connect to IP addresses in your VPC that are part of the primary CIDR block. If you have added secondary CIDR blocks to your VPC, they will not be reachable from the Private Space. You can connect from your VPC to dynos in the Private Space, but you must know the IP address in advance. Dynos do not have public DNS records. You cannot connect directly to data services such as Postgres, Kafka or Redis in the private space from the peered VPC. Dynos cannot connect directly to other networks that are peered to your VPC. Instead, you need to run a proxy or load-balancing service inside your VPC to enable such connections. You can peer up to 5 AWS VPCs to a private space. Open a support ticket if you need to peer more than 5 VPCs to your private space.